Students explore the geosciences, learn about career opportunities and receive guidance in applying to college during a weeklong program. The College of Geosciences welcomes the fifth class of GeoX, the weeklong summer program that introduces high-school sophomores, juniors and seniors to environmental programs, geography, geographic information science and technology (GIST), geology, geophysics, meteorology and oceanography. This year, 22 are on campus and on field trips, June 7–12. “GeoX provides students their first step to a successful college experience and a long and productive career in the geosciences,” said Judy Nunez, director of recruitment for the College of Geosciences. Individual and corporate donations provide the funds for GeoX to cover room, board, field trips, and student counselors, Nunez says, which makes the experience more affordable during a time when parents and students are trying to save for college. More than 20 faculty, graduate students and staff volunteer their time. Dr. Chris Houser, associate dean for undergraduate and faculty affairs and associate professor in geography, is the faculty leader for the program. The Texas students are from schools ranging from El Paso, the Rio Grande Valley and Galveston to San Antonio, Laredo and Houston, and out-of-state as far away as Minnesota. Students and their parents are welcomed the first day with a bar-b-cue tailgate on the lawn in from of the O&M building. “The week is filled with hands-on activities, experiments and demonstrations given by geosciences faculty members and graduate students,” Houser said. The students will also go on the road to visit BP headquarters in Houston. “After exploring the various disciplines in the geosciences, the students will also talk to professionals in the field who will walk them through some career opportunities in a variety of fields,” Nunez said. GeoX ends with the Amazing Race, a geocaching event that eventually leads students to their destination, lunch in the MSC with their parents. While on campus, the students stay in Eppright Hall and dine at campus facilities or local spots around town. “In addition to the academic side,” Nunez said, “we also give students a slice of Aggie life,” adding that the students will also spend time at the recreation center, swimming pool and the Memorial Student Center. Contributions from BP America, Houston; James Benham ’01, president, JB Knowledge Technologies, Bryan; Timothy Bryan ’72, CEO of Bank & Trust, Bryan; Chris Dailey ’93, CEO of Dailey Electric, Bryan; Eddie V. Gray, president, Gray Enterprises, Baytown; and Guy Matthews, Guy Matthews and Associates, Houston, funded the all-expenses-paid program. For information about next summer’s GeoX 2016, or other recruitment opportunities, contact Judy Nunez (jnunez@tamu.edu) or 979-845-3651. 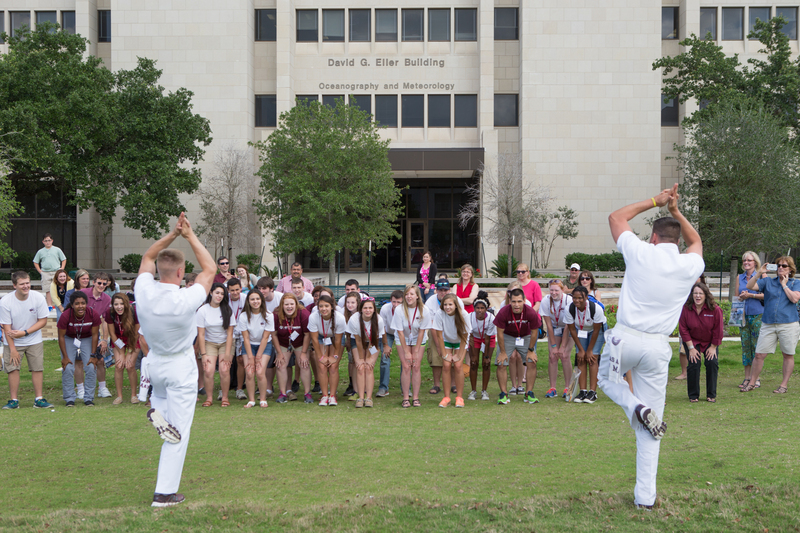 Texas A&M Yell Leaders teach the GeoX class of 2014 how to "hump it."